London Fashion Week has officially kicked off in a flurry of street style photographers, fashionistas and lots of cups of coffee. We always head down to Somerset House to catch a presentation or two (including a very special show this Saturday - stay tuned for more news) and discover the latest up and coming designers. 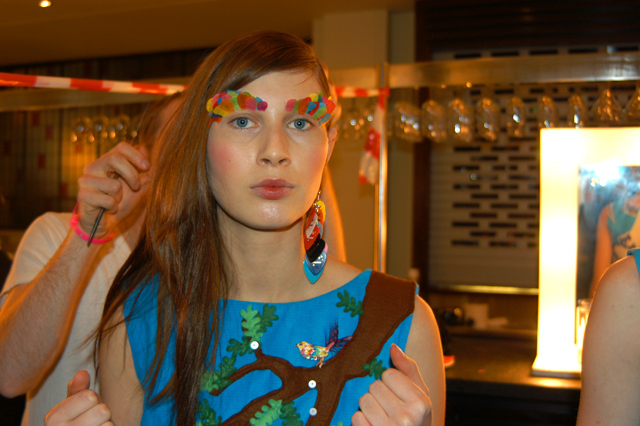 Not so long ago, Tatty Devine was one of them! Back in 2000, Rosie and Harriet made their debut at Somerset House with one of our earliest collections, featuring hand embellished gem belts, dart flight pendants, tape measure rosettes and leather cuffs. Accompanied by a handmade glittering sequin sign with rainbow lettering (which still sits in pride of place in our East London studio), they presented Tatty Devine to the world - and never looked back! 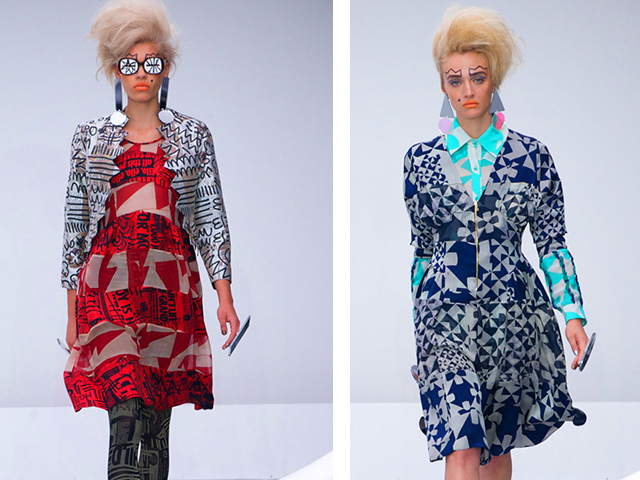 Over the past fifteen years, we've appeared at London Fashion Week both to showcase our work and team up with like minded designers. 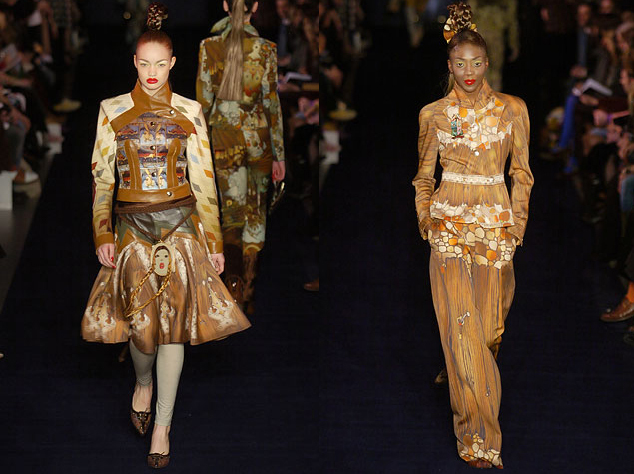 Join us as we explore the archive and revisit some of our most iconic LFW moments: In 2003, we showcased our Autumn Winter 2003 collection, Unreal Life as part of Fashion East alongside Jonathan Saunders and Roksanda Ilincic. 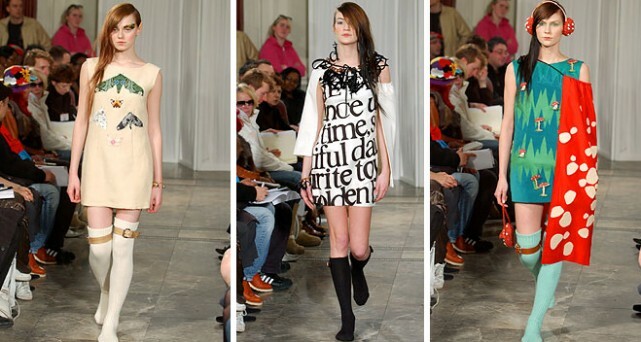 The collection didn't just encompass jewellery - Rosie and Harriet created mini dresses, capes and jumpers all inspired by 1970s children's film, The Singing Ringing Tree. British Vogue covered the catwalk show and captured every single look - see the full collection here. We even showed the very first version of the Wooden Bird Brooch (and a plectrum earring, too!) Back in 2005, we teamed up with digital print pioneers Basso and Brooke to create accessories for their Autumn Winter 2005 collection. Inspired by the show's title, The Succubus And Other Stories, we recreated axes, swords and shields as brooches and pendants in hand painted wood. Scantily clad sirens sat atop piles of treasure and keys became a key motif. We love a sequin here at Tatty Devine HQ, so we were over the moon to create jewellery for king of sequins Ashish's Spring Summer 2009 collection. From initial brooches to Pegasus Necklaces and laurel wreath inspired statement pieces, each piece epitomised the theme of 'hard glamour': 2009 saw us team up with designer Peter Jensen to create bunny-tastic accessories for his resort collection. Star of the show? Statement sunglasses in black and pink Perspex, complete with silhouette ears and whiskers and chunky charm bracelets featuring his signature rabbit logo: They don't come much more colourful than British designer Louise Gray! Just as her debut range for Topshop hit the shelves, the larger than life jewellery we designed for her Spring Summer 2013 show hit the catwalk. Louise's hand scrawled slogans were laser etched and inked upon oversized mirror Perspex rings and shoulder-sweeping earrings shimmered with an iridescent finish: Watch out, the Little Monsters are coming! 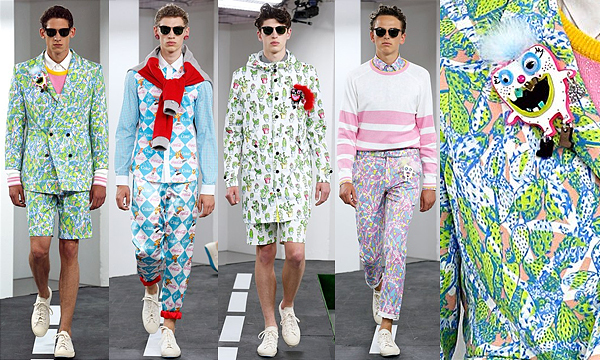 We revealed our upcoming collaboration with menswear designer Kit Neale at his Spring Summer 2015 LCM presentation. Launching in November, these cheeky little creatures are adorned in marabou feathers, googly eyes and tiny boots and can't wait to find new homes in your jewellery box: Exciting news! The studio has been a hive of activity this week as we prepare to reveal our top secret new collaboration. Make sure you tune into the London Fashion Week live stream on Saturday 13th September for your first look. Can you guess what it is...? Kicking yourself for missing out on classic designs? Shop the 15th Birthday Collection in store and online now!